Shelf Inflicted: The Family That Shocks Together . . .
Annie and Buster Fang, like so many twenty-somethings, blame their parents for the lack of fulfillment and success they find in their careers and in their personal lives. However, unlike many twenty-somethings, Annie and Buster may have a valid claim for blaming their parents for their seeming lack of autonomy and self-actualization. That's because the Fang children's parents were artists--as in Artists (that's right with a capital A and italics). And not just any kind of artists, but performance artists hell bent on causing chaos in established patterns and the unexpected in the routines of daily life. Their parents, Caleb and Camille Fang, are nothing if not utterly dedicated to their art, which involves creating elaborate "happenings" in the most predictable of American venues: the mega-mall. People lulled into hypnotic trances by muzak, colorful window displays, and giant pretzels are prime targets for the art favored by the Fangs. Always admonished by their mentor that "children kill art," the Fangs create an unconventional solution to preserve their art and raise their family: Annie and Buster become Child A and Child B, props used by their parents to pull off the increasingly elaborate happenings. Flash forward to Annie and Buster as adults. Both have managed to completely FUBAR their adult lives and return to the Fang family nest for a real world time-out. Immediately drawn back into the weirdness created by their parents, Annie and Buster revert to their childhood roles. Buster becomes the sensitive younger child, always anxious to please his parents, while Annie becomes the protective older sister, encouraging Buster to challenge their parents' authority. Shortly after their return, the Fangs disappear and foul play is suspected by the authorities. Annie and Buster, however, believe this is another elaborate art piece created by their parents and must examine their seriously dysfunctional relationship with them as they search for the truth. 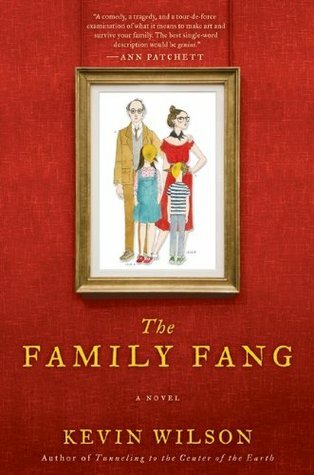 The Family Fang explores a dilemma faced by every family. Most parents consciously or unconsciously push their children toward their own personal passions and expect this shared love (whether it be art, football, reading, politics, etc.) to create a bond that no one can break. Problems inevitably ensue when the child begins exploring the world on his own terms and begins to assert himself as his own being. In the case of the Fangs, Annie and Buster try to create their own brand of art (in her case, acting, and, in his case, writing), but find that, after years of their parents controlling and shaping the events around them, they are ill-equipped to just let life happen. If all of this sounds weird, it is. But it's also very entertaining and not nearly as dark as one might expect. Populated with quirky characters and clever dialogue, Wilson's narrative avoids taking itself too seriously by inserting absurdity and humor in all the right places (especially in the scenes where Annie and Buster bicker and banter like close siblings do). This is a solid 3 1/2 stars and the only reason I didn't give it a 4 is because I enjoyed the first half immensely; however, after the Fangs disappear, I felt as though the shift to the mystery plot was too abrupt and unexpected (granted, that was probably the point, but it just didn't work for me).